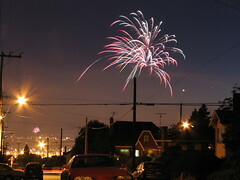 Fireworks set off on Beacon Hill (and -- look close -- West Seattle) on July 4, 2007. Photo by Wendi. Other topics currently in the Forum include an announcement about Bible and Chinese Camp at the Beacon Lutheran Church, questions on the current status of the car wash at 15th and Beacon, discussion about a recent brazen burglary in broad daylight, and an introduction from Colin, a (relatively) new neighbor! Do you have something to say, an announcement to post, or a question to ask? Join us in the Forum.